The monument is located in the midst of a commercial forest. Access to it has been compromised due to open-cast coal mining, and local inquries should be made. Sadly the original 'Old Mortality' tombstone no longer exists although a small fragment could once be seen resting against the current monument. This piece has since been moved to the Baird Institute, Cumnock for safe keeping. However this loss was to result in the discovery of New Cumnock's most prized Covenanting relics. In 1826 when the foundations of the current tombstone were being laid, the bodies of the Covenanters were found perfectly preserved in their peaty resting place. A lock of golden hair and piece of woollen pawkie were recovered and remained in possession of the family of Ivie Campell of Dalgig farm for many years - these too can now be found at the Baird Institute. The current monument was erected in 1826 and repaired in 1896 both events being recorded on the reverse side of the main inscription A.B.Todd one of the finest poets on Covenanting traditions describes the Rev. David McAllister as 'one of the most eloquent ministers and able writers of that great country'. 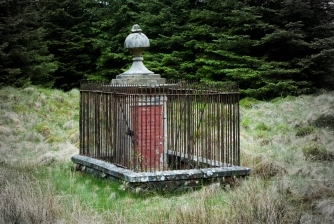 Joseph Wilson, John Jamieson and John Humphry were seized by government troops close to the summit of Carsgailoch Hill and shot on the spot. There is no tradition of them being offered their lives in return for accepting the monarchy. Sadly, little else is known of the three Carsgailoch Martyrs. The name Wilson has strong ties with New Cumnock in a Covenanting context. James Wilson of the Old Castle featured in a proclamation of 1684 for 'the apprehension of those bearing arms or for harbouring those that did'. The surname Wilson appears thirteen times in 'A List of hearths of the paroch of Cumnock, Old & New' (1691), including James (2), John (6), William (3) and Sarah (1). Margaret Wilson, the young Wigtown Martyr and daughter of Gilbert Wilson is said to have been born near the River Nith at New Cumnock. from Dalmellington to Muirkirk would take these Jamieson brothers over the heights of Carsgailoch.